A security analyst has mounted a spirited opposition to the existence and relevance of the Ministry of National Security at the Presidency. Adam Bona therefore wants the office occupied by Bryan Acheampong scrapped. His comments follow the report of the Emile Short Commission that investigated the Ayawaso West Wuogon by-election violence, which recommended to the president to sanction the minister of state. He argued on TV3’s [email protected] Friday that the role of the minister has been conflicting with that of the substantive minister for National Security, accusing the former of arrogating extra powers to himself. “In one way or the other he has been usurping the appointment of the substantive National Security Minister,” Adam Bona observed. “The question I keep asking myself, do we need a National Security Minister at the Office of the President? We don’t really need it. What role is he performing, is he in-charge of presidential security or he is in-charge of the bigger national security?” he queried. “Instead of having too many security ministers performing functions that have not been assigned to them”, he suggested, Bryan Acheampong could probably be reassigned to the National Security Ministry as a deputy minister. 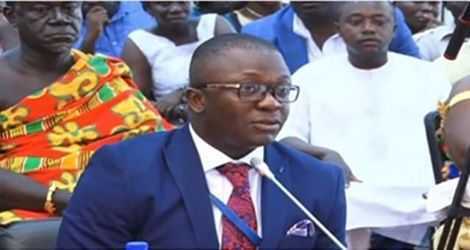 Bryan Acheampong who is also the Member of Parliament for Abetifi had admitted knowledge of the operations of armed masked men that brutalised citizens on January 31. The three-member presidential commission said in a leaked report that Mr. Acheampong should take “ultimate responsibility” for the operation which resulted in the shooting of at least six people. But Adam Bona was of the view that the Commission should have been explicit and demanded that Bryan Acheampong is made to step aside. Meanwhile the Commission has recommended the removal of the commander of the police SWAT team at the National Security Council Secretariat, DSP Samuel Kojo Azugu who led the operations on that day. Siding with the commission, the security analyst reechoed his earlier position that “DSP Azugu is an apology of a police officer” and prayed that he should be sanctioned for his role in the brutality. Also, a national security operative, Mr. Ernest Akomea alias ‘Double’ is to be prosecuted, according to the commission’s recommendations to the president. During his testimony before the commission, ‘Double’ confessed using an unauthorized weapon in the SWAT team’s operation at the residence of the National Democratic Congress (NDC) parliamentary candidate for the by-election.